Patrick, who hails from County Antrim, has trained in a number of the great kitchens in Europe, from Germany and Switzerland to France. 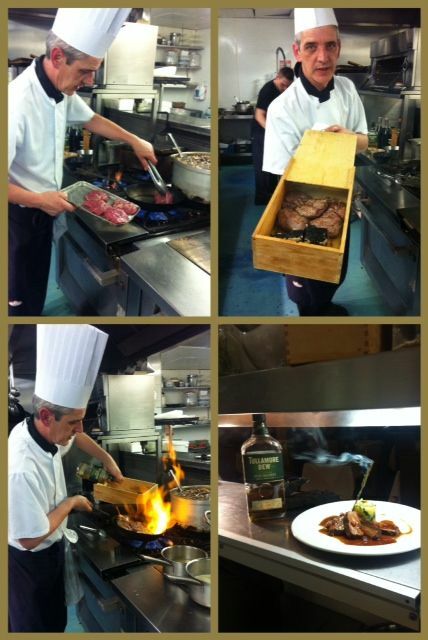 His considerable experience allows him to deliver exquisite dishes with a distinctly Irish flavour. Patrick has worked in Brooks Hotel for the past 17 years and often pops in to the restaurant to say hello to diners. Patrick’s passion for food started in the countryside of his childhood home in County Antrim and has stayed with him to this day in the kitchen at Brooks. As a young child Patrick grew up near orchards and farms and his interest and passion for food was established from a young age. The influence of Patrick’s childhood is what makes his cooking in Brooks Hotel so distinct. Patrick’s menus are carefully crafted and incorporate the freshest seasonal produce available. Patrick has cultivated an Urban Herb Garden, located at the hotel, growing seasonal fruit such as fresh summer tomatoes and strawberries and a selection of herbs including parsley, oregano and mint. These ingredients are used in many of the hotel’s dishes. Another passion of Patrick’s is foraging. He frequently takes the kitchen team to the Wicklow Mountains to source mushrooms, berries and one of Patrick’s favourite ingredients, Elderflower. He uses Elderflower and the Elderberry to create cordials, sorbets, coulis and delicious Elderberry infused vinegar, (the perfect accompaniment to a Summer salad!). For Patrick, foraging is a way of life. Patrick’s cooking and inventive nature has been recognised for its quality by food critics in The Irish Times, The Irish Independent and as a member of Good Food Ireland. The restaurant is renowned for its approach to providing excellent home cooked food using the best ingredients. If you are dining at Brooks Hotel and you would like to delve deeper into the origins of the ingredients of your dish, Patrick will always be more than happy to enlighten you personally. Soda bread is quick and easy to make, traditionally it is made plain or with dried fruit. Here at the hotel, we like add a variety of ingredients including grated cheddar cheese, tomato puree and fennel seeds and mixed seeds like sunflower, pumpkin, linseed and flax seeds. You can also use a wholemeal flour to make a brown soda bread. You will find our homemade brown soda bread at breakfast every morning. 1) Pre-heat the oven to 190oC/380oF. 2) Sieve the flour, baking soda and salt into a large mixing bowl. 3) Add the sugar to the flour mix and rub in the butter or oil. 4) Make a well in the centre, cut in the buttermilk with a palette or broad bladed knife until the mix comes together. Remember it is important not to overwork a soda bread mix. The decision is now yours, either shape into two plain breads and bake or choose to add some extras. Here at Brooks, we usually divide the batch and add a variety of ingredients. 6) For the other half, add the mixed seeds and dried cranberries, knead in lightly and shape the mix. 7) Bake in the pre-heated oven for 35 – 40 minutes until the loaf is golden on top. The loaf should sound hollow when tapped on the base.